Last week, FTSI alerted our customers that an Eastern European gang active in Northern California that had hit multiple ATMs cleaning out their entire supplies of cash. Then just 72 hours later, FTSI service technicians discovered a card skimming device (pictured below) on a customer’s machine and removed it. These gangs typically insert card reader devices after 5 PM on Fridays to capture cardholders’ information during the high transaction volume that occurs over weekends. Then on Sunday evenings, they remove the devices and collect the information. 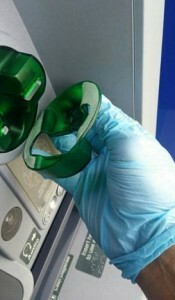 Criminals are using advanced skimming overlays that are nearly identical to what you would find on the ATM card scanner. To see a demonstration of how the card skimmer works, and how products like the Skimming Protection Solution and Card Protection Kits can help stop the threat, click here to watch a video. of tampering and we thank them for that!